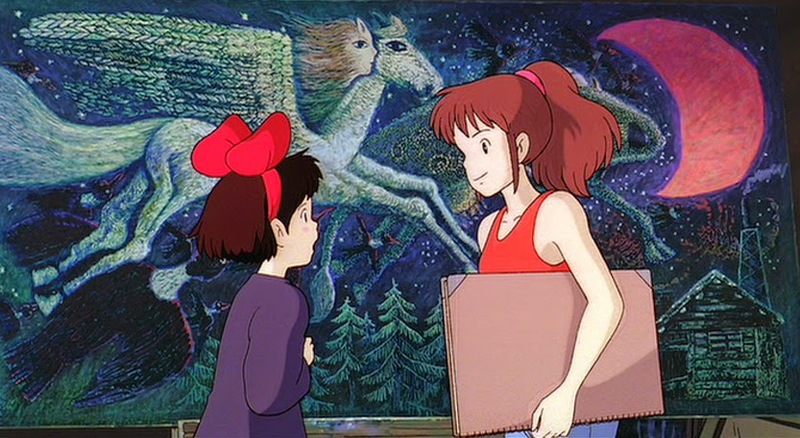 Kiki's Delivery Service is a very normal children's film and by Hayao Miyazaki and Studio Ghibli's very high animated standards it is therefore tempting to label it as something of a disaster. To do so though would be an injustice. Even the world's best directors have lesser works, works that if you were to release them under an assumed moniker would still be received as the perfectly acceptable films that they are. Kiki's Delivery Service is not a disaster, merely Miyazaki stretching himself a little less far than he normally does. Even that far though is far enough to imbue Kiki's Delivery Service with a level of competent commentary. The topic in question this time? It feels like one for the parents, something about letting your children out into the world to flourish and find their way, particularly potent if your child happens to have a talking cat and broomstick that flies, though in Kiki's hands not always in the right direction. As stories and messages go it's in-keeping with the accepted prognosis of this film: it's simple and it doesn't overreach. Whilst you can forgive Miyazaki for the simplicity, there are oddities here that feel strangely out of touch with the director's usual level of commentary. The visual framing of almost every scene, for example, is much busier than the director's usual preference for clean and classy styling. The opening meadow is full of distractions, which continue throughout, a world away from the dense but uncluttered forestry of something like My Neighbour Totoro. The script too has some painfully on-the-nose moments, particularly when Kiki starts to converse with Tombo in the film's second half. There's also a real lack of humour amongst the humanity, that element resting solely with the cat, Jiji, who is admittedly another quite sterling Miyazaki creation. The reasoning behind not marking Kiki's Delivery Service as a true low point though should be all too obvious come the finale. Relying, unusually, on a traditional climactic piece of action, you will find yourself fully behind Kiki, rooting for her simple ethos against the complicated inactive voyeurism of the city's residents. It's not as transcending as some of Miyazaki's other works, but it's still a sometime-sublime animated effort.